Watch the video of the network launch. Susan Thomason and New Zealand hockey player Blair Tarrant. Massey University has become the first New Zealand university to sign up to a new ‘Athlete Friendly Tertiary Network’ set up by the New Zealand Academy of Sport. The academy has recognised Massey’s drive to nurture high performance athletes and wants all universities to join the network. The network will be made up of tertiary institutions that agree to adopt a set of guiding principles to support New Zealand’s high performance athletes to combine their sporting and academic aspirations. 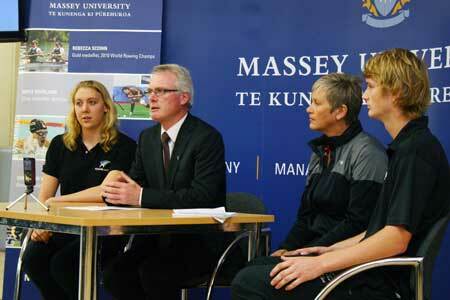 “We’re delighted that Massey is the first member of the Athlete Friendly Tertiary Network. It is very fitting given the considerable support they have given athletes,” the academy’s athlete life manager, Susan Thomason, says. Massey Vice-Chancellor Steve Maharey says the University has placed huge emphasis on creating a supportive environment for student-athletes both on and off campus. The University employs a high performance co-ordinator who is dedicated to supporting student-athletes with all of their sporting and academic requirements. This year, Massey is the largest tertiary provider for 119 of the Prime Ministers’ Athlete Scholarship recipients. At last year’s Commonwealth Games, 41 members of the team were Massey student-athletes, with 31 winning at least one medal. Eight of the 10 medallists at the 2010 World Rowing Champs were Massey students. The value of athletes being able to pursue academic studies is well documented and the Athlete Friendly Tertiary Network will enable a more structured and effective system for both athletes and tertiary staff. Massey University led the way to sign the agreement followed by Victoria University, AUT University and the University of Waikato. Massey University has a long history of providing the support elite athletes require for studying while competing on the world stage. Massey University is the chosen tertiary provider for the majority of elite athletes, including scores of Olympic and Commonwealth Games medallists and others who are making a mark internationally. Massey University has the expertise in sport science, sport management and nutrition that provides ongoing research to improve performance. Massey’s Academy of Sport provides student-athletes with key sport science services to assist in athletic development, physical conditioning, sports nutrition and sports psychology, all provided by NZAS accredited providers. Massey offers a range of benefits through its Academy of Sport programme, including individually tailored athlete support, sport scholarships for academic fees, travel funds for assistance with international competitions, gym memberships and training gear, and practical seminars on the latest developments in the sporting world. The University is home to the School of Sport and Exercise, headed by some of the country’s leading sport science researchers. The School of Sport and Exercise also has leading researchers in sports management, teaching the business skills and sports-related subjects needed to gain a place in the industry, whether in management or coaching. Through Team Massey, elite equestrians now have the chance to study at Massey while competing at the highest level. A team of experts is supporting the young riders to combine study and an equestrian career. Team Massey includes internationally recognised riders and coaches, equine experts in nutrition and physiotherapy, as well as human performance experts, who mentor and support students accepted into the programme. The University boasts arguably the top sporting facilities in New Zealand. -Best equipped recreation centre in Australasia (Albany campus). -Sport and Rugby Institute the University’s High Performance Centre. -Equestrian arena and recreation centre (Manawatu campus).